Matcha is for more than sipping. 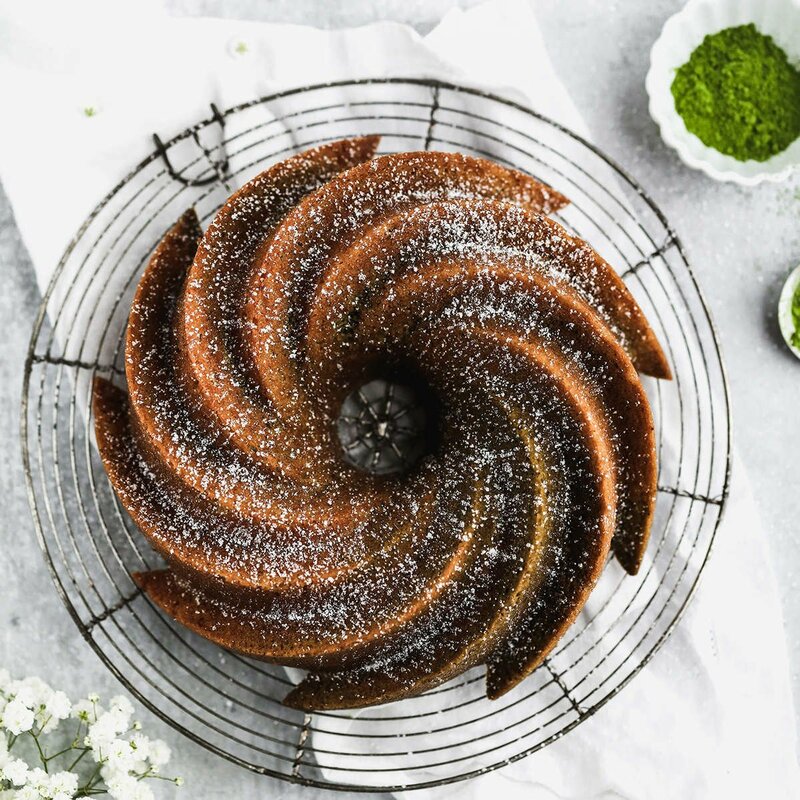 Our friend Heather of Brown Butter Blondie developed this satisfying Matcha Bundt Cake recipe using our brand-new house matcha showcasing just how versatile this health-packed green tea is. Made with olive oil and almond flour, her light yet complex bundt cake is dusted with a sprinkling of powdered sugar for a wow-worthy finish. Generously grease bundt pan or 10-inch spring form pan with cooking spray. In a large bowl, whisk together eggs, sugar, olive oil, and milk. Mix the dry mixture into the wet mixture being careful not to over mix. Fold in the almond flour and hazelnut flour. Divide cake batter in half and add 2 TBSP of matcha powder to one half of the batter and mix gently until just combined. This will leave you with two batters. Spoon batters into the bundt pan alternating between the regular batter and the matcha batter. Insert knife or chopstick into bundt pan and drag in a “Z”, mixing the two batters together in a beautiful swirl design. Bake for 50-55 minutes, checking cake at 40 minutes to be sure it is not browning too quickly. Cover the top with a piece of foil to prevent the top from browning. Once toothpick inserted in center comes out clean with few crumbs remaining, remove the cake from oven and cool 30 minutes on a wire rack. Invert pan onto a large platter or plate and tap gently to release the cake. Cool completely before dusting with confectioner’s sugar.